You graduated in 1970s did you ever want to be a rock star instead of a Captain? Laughs No. I wanted to be a football coach. I had planned to go to Sonoma State and had already been accepted as a physical education major with a minor in history, because I’m a history nut. I had it all planned out on how I was going to work my way up to being the coach of an NFL team. Then my Dad’s friend, who went to Cal Maritime, told me about this school so I went down for a visit. I remember driving through the huge iron gates that used to be at the front. The ship was not even here. I visited in the cold of winter and remember having this feeling of something coming over me – that I belonged here. Right then I decided that this is what I wanted to do and this is all I have been doing it for the last 44 years. Describe your lightning fast rise to captain. Well I spent a lot of time at sea during the early years, and the day I had enough sea time for raising my license I went and took the test. When I joined AMO, I sailed 5 months on my first ship and 8 months on my second ship. Took my 2/M test and sailed 6 months on my third ship and 7 months on my fourth ship, then took my Chief Mates test. Then did a couple more 6-month tours and got my Masters License. Sailing for long periods in the early days was easy as we were going to cool places and I loved it. I was be on a few tramp ships just jumping from port to port all over the world. Every time a raised my license – I sailed on it. During that time, I saw a lack of leadership on several ships and it caused a lot of trouble aboard those ships. The senior officers were unwilling to change with the times and I was a baby boomer, from a different generation than those people. I felt that the best way for me to make positive change, was if I got to be the person in charge. So you were the change in the world you wanted to see? Yeah, I guess you could say that! How old were you when you first sailed as Captain? What does a young manager need to do in order to be a leader of people who are older and have been in their jobs longer? The first thing that a Captain has to know is every member of his crew on a first name basis. He should know where they are from and where they worked before joining my ship. One time I had 13 different nationalities on my ship of 30 crew. I made sure to know each of them. Where they are from, which of them has kids, which of them is married or perhaps divorced? These little bits of information may explain a particular behavior. I would make sure to treat them fairly with this personal knowledge in the back of my mind. When I spoke with them, I would inquire about the family, or talk about their home country. This shows the crew that you care and I was truly interested in what they had to say. You do this and it will not matter how old your crews are and how you get along. It also helps if you know what the hell you are doing and prove it every day. The second thing is discipline. Ships demand discipline and the crew wants and requires discipline. Keep everything black and white, no gray areas. Lead by the rules and do not compromise. If you compromise – you are done. The entire crew will know it. This is true among all age groups. The third tenet is Communicate! I would tell each crew member my expectations of them. Every single member – the steward assistant, the oiler all the way up to the chief engineer. I would personally tell them, “This is your job, and this is what I expect of you.” Hold crew meetings at every crew change and restate your expectations. The fourth tenet is a clean and well-fed ship is a happy ship. Do not underestimate the power of these two important aspects of shipboard life. Especially with the older crewmembers. Make sure to maintain professionalism at all times. You’ve described your highlight of your time as Captain as the Persian Gulf War. Have you returned there for vacation? Yes I have! I’ve gone to Dubai for vacation! You’ve also returned to CMA where you instituted the International Safety Management code (ISM). Yes. The ISM code has been the industry standard long before I got here. It was very important to implement this aboard the USTS GOLDEN BEAR. Not only for the safety of the cadets, but also for them to know what an ISM certified Safety Management System is before entering the industry. We were the first maritime academy and training ship to become ISM certified. Would you consider yourself an ISM Evangelist, bringing safety to the unsafe? I wouldn’t call myself an evangelist because ISM had been around for a while before I brought it to CMA. I have friends, many friends, in the industry who all say, “Your (CMA) cadets get on a ship and they know what’s up” with ISM. You’ve served 10 years as Captain of the Golden Bear. Why didn’t you stay 10 more and make a career out of it? Look, I already had a 30 year career before I got here buddy. Laughs I will stay in the industry as a consultant; but it is about time to go home. Well I am glad I will not have to compete with you at the union hall for my first 3rd mate job. Yeah, you do not have to worry about that. The Food at the new Mess Deck? The memories you made as Captain at CMA? Working with the cadets and particularly the Corps Officers was certainly a highlight. Modernizing the ship with the latest technology was a huge undertaking. The TSGB crew and Waterfront crew have done a great job having all of our maritime assets ready for cruise and boat classes. We did go on some epic cruises. 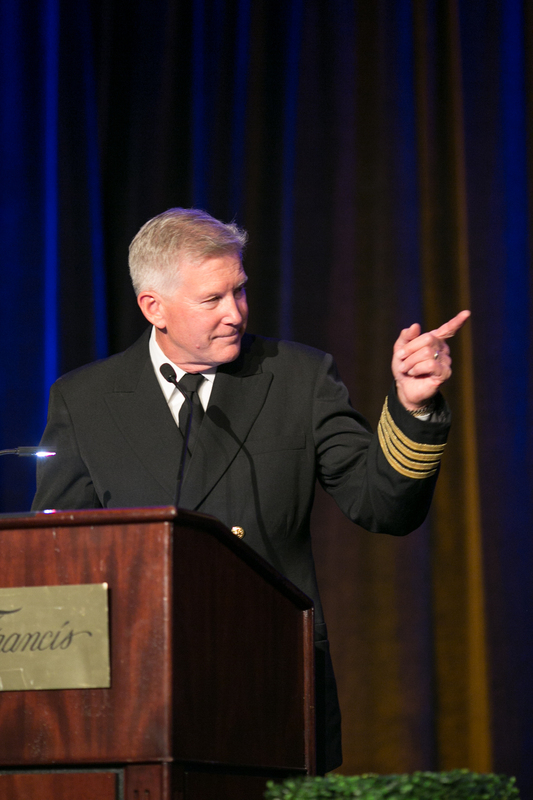 It has always been about the Cadets and Cal Maritime – not me. It is about giving back and paying it forward. I am a big believer in that. ← Previous Previous post: What Does Subchapter M Mean for Towboats?